Take a gander at our trophy fish, today's featured quiz. 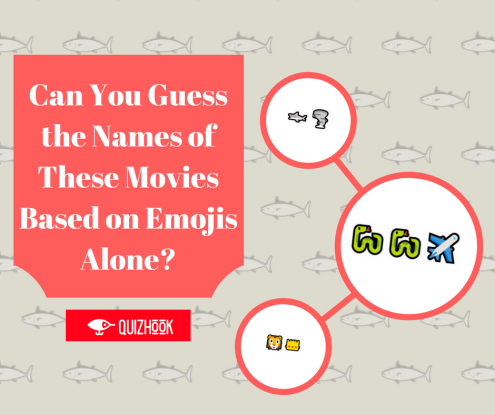 Can You Guess the Names of These Movies Based on Emojis Alone? How do you get all of the latest QuizHook quizzes in your inbox? Our most recent quizzes, freshly caught just for you! How Many Movies from the 60s Can You Name? Can You Name the Capital of Every EU Member? Which Dog Breed Is This? Slay This Millennial Slang Quiz! Can You Name These 50 Wonders of the World? Do You Know the Countries of the Americas? Only a Real Geography Expert Can Correctly Name Every European Country! Our trending quizzes, a.k.a. the most popular quizzes from this week. See what your fellow quiz-takers got hooked on! Do You Know the State Capitals? Which U.S. State Is That? How Many 80s Movies Can You Name? How Many 90s Movies Can You Name? How Well Do You Know The Wizard of Oz? Can You Guess the Names of These Historical and Antique Items? The Ultimate Hamilton: An American Musical Quiz! Put all those hours wasted on Netflix to good use. Dive deep into the past for some history-related fun! History quizzes. Dive deep into the past for some history-related fun! How Many of These Mythological Creatures Can You Name? How Much Do You Know About Astrology? Can You Name Every President of the United States? How Well Do You Remember Greek and Roman Mythology? Get Hooked on these Animals! Whale, whale, whale... look what we have here. How Much Do You Know About Cat Breeds? Can You Name the Parents of These Exotic Hybrid Animals? Which Cat Breed Is That? Which Deadly North American Animal Is That?